A Dirndl is a traditional German dress. We have one in our family that my Mother wore when she immigrated to Canada from Germany as a child over 55 years ago. When I was a young girl, I wore this same Dirndl to German School and other cultural celebrations in my community. And this year, when Bridget was learning about family history at school, she wore the same dress. It is truly special to have this Dirndl to pass down through the generations; it is a treasured family heirloom, a link to our past, to the story of our family. Are you the same way? Do you have any sentimental clothing items hanging in your closet? Any garment links to your family's past? Please share, I would love to hear. That is so cool that you have that! 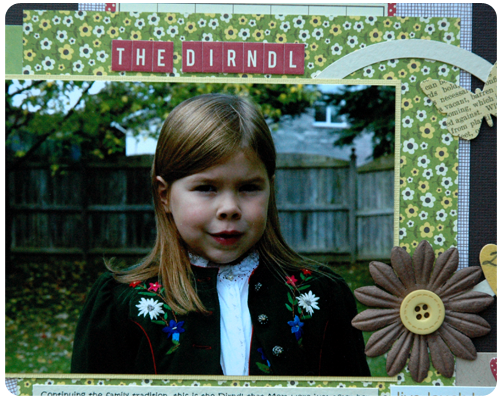 I never knew what a dirndl was (I had seen them, but didn't know the name) until earlier this year when I was preparing to go to Oktoberfest. Of course, I bought a dirndl and wore it the whole time. It was amazing how much the dirndl was a part of the culture. So cool you have an original! Thanks Samantha. I love that this dress is an original and that it is so rich in family history. Thanks for stopping by. How cool. Love the layout!! !